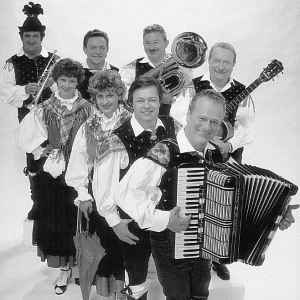 Successful Slovenian folk/polka ensemble with jazz tinges that was instrumental in defining the "Oberkrainer" sound. Formed by brothers Slavko Avsenik and Vilko Avsenik (who later retreated to the role of composer/arranger only), the group can trace its roots back as far as 1953 and a previous incarnation of Ansambel Bratov Avsenik. As the band membership and their fame grew, so did their name (from "Quartett" to "Quintett" -- see variations) until they settled on the German language name of "Slavko Avsenik Und Seine Original Oberkrainer", a territory in which they arguably had their greatest success. Over 31 million sold records later, in 1992, Mr. Avsenik handed the reigns of his legacy to the "Gašperji" (later renamed to "Kranjci") ensemble, nowadays known as Die Jungen Original Oberkrainer.